Leonardo da Vinci was the first European creative thinker to write about the importance of making art by introducing random and chance events to create artistic patterns. He advised people to contemplate the walls, clouds, pavements, encountered in their everyday environment, with the idea of looking for patterns and images to conceptually blend with creative thoughts. He would gaze at the stains of walls, the ashes of a fire, the shape of clouds or patterns in mud. He would imagine seeing trees, battles, landscapes, figures with lively movements, etc., and then excite his mind by conceptually blending the subjects and events he imagined to embellish his vision. It is said that Da Vinci would occasionally throw a paint-filled sponge against the wall and contemplate the random stains and what they might represent. In hurling his paint-filled sponge at the wall Leonardo was initiating a process governed by the second law of thermodynamics. Muscular energy is converted to the squidgy sound energy of impact and the kinetic energy of motion when the sponge's elastic structure is compressed and the paint is ejected. There is also a release of heat energy on impact, which warms the wall ever so slightly. The thermodynamic result is that the energy of muscle contraction has been irreversibly, and unpredicably dispersed into the environment. The outcome is measured as entropy, which is a quantification of how much energy has flowed from being localized, in this case within Leonardo's muscle, to several different forms that have become more widely spread out in the environment. Throwing a sponge provides a demonstration of the increase in entropy that accompanies all processes in the universe. It can be placed alongside other common examples; of hot milk cooling, balloons bursting, forest fires burning, skin wrinkling with age and water flowing down mountains. § 9. "Perfect permanence and absolute security were evidently in nowise intended. It would have been as easy for the Creator to have made mountains of steel as of granite, of adamant as of lime; but this was clearly no part of the Divine counsels: mountains were to be destructible and frail; to melt under the soft lambency of the streamlet; to shiver before the subtle wedge of the frost; to wither with untraceable decay in their own substance; and yet, under all these conditions of destruction, to be maintained in magnificent eminence before the eyes of men. Nor is it in any wise difficult for us to perceive the beneficent reasons for this appointed frailness of the mountains. They appear to be threefold: the first, and the most important, that successive soils might be supplied to the plains, in the manner explained in the last chapter, and that men might be furnished with a material for their works of architecture and sculpture, at once soft enough to be subdued, and hard enough to be preserved; the second, that some sense of danger might always be connected with the most precipitous forms, and thus increase their sublimity; and the third, that a subject of perpetual interest might be opened to the human mind in observing the changes of form brought about by time on these monuments of creation". The argument was part of his theme of landscape painting in which the aesthetic and philosophical aspects of geology were major points of focus. This is borne out by his description of the Pass of Faido which was the subject of one of his etchings (Fig 1). In a modern setting the alpine pass would illustrate the ecosystem services provided by watersheds. Century by century its relatively small stream contributes ceaselessly to the planet’s ever-increasing entropy. He writes, "There is nothing in this scene, taken by itself, particularly interesting or impressive. The mountains are not elevated, nor particularly fine in form, and the heaps of stones which encumber the Ticino present nothing notable to the ordinary eye. But, in reality, the place is approached through one of the narrowest and most sublime ravines in the Alps, and after the traveller during the early part of the day has been familiarized with the aspect of the highest peaks of the Mont St. Gothard. Hence it speaks quite another language to him from that in which it would address itself to an unprepared spectator: the confused stones, which by themselves would be almost without any claim upon his thoughts, become exponents of the fury of the river by which he has journeyed all day long; the defile beyond, not in itself narrow or terrible, is regarded nevertheless with awe, because it is imagined to resemble the gorge that has just been traversed above; and, although no very elevated mountains immediately overhang it, the scene is felt to belong to, and arise in its essential characters out of, the strength of those mightier mountains in the unseen north". By writing in this way Ruskin had himself become part of the random and chance dynamics of the geological process which had produced the scene he depicted. Actually, for centuries, hauntingly beautiful water-worn 'viewing stones' had captivated the imagination of Chinese scholars with their randomness of shape and colour.They the have the power to suggest a scene or object, very much like looking at a cloud and seeing running stallions or angels, images unlimited by imagination (Fig 2). The art of making miniature rock landscapes has an ancient history. Chinese emperors and noblemen created elaborate palace gardens, complete with streams and scaled-down mountains. In time, Buddhist monks and wealthy intellectuals began to introduce miniature trees (bonsai) and spirit rocks (gongshi) in their mountain retreats and city courtyards. The Chinese word for landscape, shan shui, means 'mountains and water': mountains, because of their height, were seen as a bridge between earth and the heavens.A Taoist story tells of an old man who accidentally fell into the river rapids leading to a high and dangerous waterfall. Onlookers feared for his life. Miraculously, he came out alive and unharmed downstream at the bottom of the falls. People asked him how he managed to survive. "I accommodated myself to the water, not the water to me. Without thinking, I allowed myself to be shaped by it. Plunging into the swirl, I came out with the swirl. This is how I survived." As Chinese influence spread abroad, Korea and Japan adopted the practice of stone-collecting. Japan, especially, went on to develop the art in ways unique to its cultural ecology. In Japanese such garden stones are called water-rocks (suiseki.). 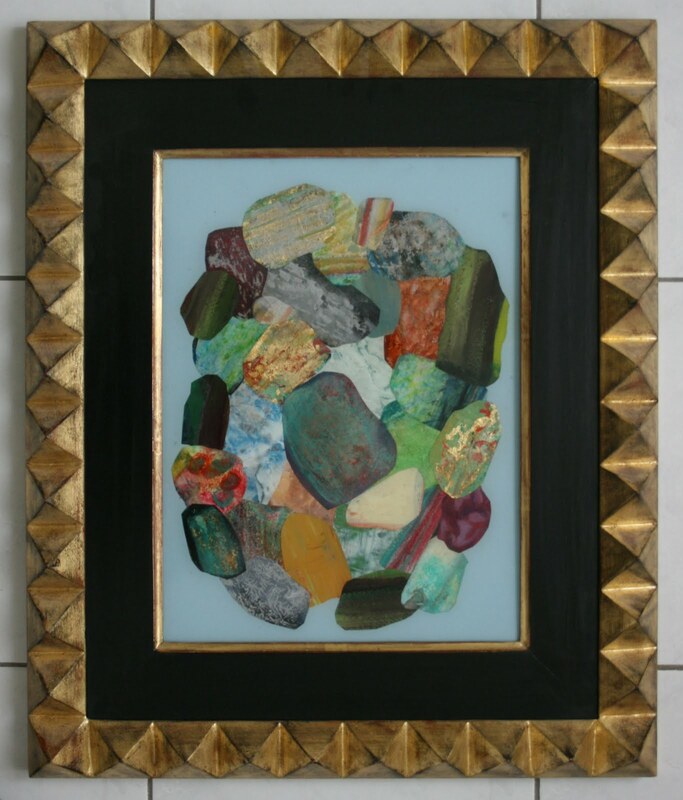 Collectors of water-rocks are actually bringing disordered nature into the home and temporarily arresting the great entropic forces of the universe which stones represent by the application of miniscule forces of hand and eye. From this point of view, suiseki may also be taken as an example of the propensity of humans to create order in the environment. In the world of suiseki, "wabi-sabi," refers to the deep spiritual understanding of connecting with a suiseki. Prized suiseki are not replicas of natural objects. They merely suggest the object and capture its essence with simple visual gestures; awakening the imagination and inviting the viewer to complete the picture. They are simplicity, in accordance with Zen teachings. They are "less is more" captured in stone. For Zen Buddhists, they are a means of understanding humankind's relationship to existence. Zen Buddhists believe that enlightenment is achieved by turning the eye inward through meditation and mindfulness of daily experiences and so maintain a close connection to nature. Perception and evaluation of complex sensory patterns is central to human cognition and awareness, yet the underlying neural coding mechanisms are almost completely unknown. The human brain is a spectacular pattern analyzer, able to make sense of the most complex images and sounds. Human pattern cognition is so rich, varied, and intense that it is a source of aesthetic pleasure and a ground for creativity. Ruskin as a reasoning human, was well equipped to detect and create ordered structure in his mind, but not to arrange things at random. Human behaviour seems to stem from a strong "sense of order", a term coined by E. H. Gombrich to express how our drive to "regularise" artefacts is a fundamental aspect of human cognition, almost as basic as our sense of smell or touch. Art is therefore the placement of pigments and objects in an order unique to the artist. The poor ability of humans to create random patterns is a physiological limitation on human creativity. Process artists engage with the randomness of organic systems when using perishable, insubstantial, and transitory materials, but works of art based on deliberate random arrangements of pigments or objects are very rare. As an example, Gesche Westphal-Fitch and W. Tecumseh Fitch conclude that Victorian-era quilt-makers were exceptional in achieving a level of intentional spatial randomness that has never been documented in any other human artefact. This conclusion came from an analysis of "Crazy quilts", which represent an historically important style of quilt-making that became popular in the 1870s, and lasted about 50 years (Fig 3 ). Fig 3 Example of a 'crazy quilt' (C") compared with a regular pattern (R8). Despite the neglect of randomness in the application of artistic creativity humankind has always showed a predeliction for the decorative effects of random patterns. Examples are the use of polished stones, particularly veined marble, to furnish buildings, and the derived craft of marbling paper, which was used widely in 19th century book binding. The study of human ageing which respresents the work of random biochemical process often begins with the skin by highlighting its loss of elasticity expressed in inevitable well-defined changes in physical properties, which include thinning, sagging, wrinkling and the appearance of age spots, broken blood vessels and areas of dryness. This is known as intrinsic ageing, also known as the natural ageing process. It is a continuous process that normally begins in the mid-20s due to intrinsic changes in the chemical bonds of the extracellular connective tissue of which collagen fibres are dominant. Collagen production slows, and elastin, the substance that enables stretched skin to snap back into place, becomes less springing. Elastic bands stored in a draw mimic the increased chances of death with the passage of time. These changes in skin usually proceed relentlessly at a rate that intrigued Rembrant who left more than eighty paintings, etchings and drawings of himself recording his facial appearance throughout his career. Effects of time and environment are already written on his face in a self portrait produced in 1657, age 51, where he explored the subtle colouring and textures of ageing skin with startling objectivity (Fig 4). In is book, Happy Accidents, Morton Meyers, notes the risks of being stuck in established modes of inquiry; the answer, he writes, may lie in a different direction that can be seen only when perception is altered. 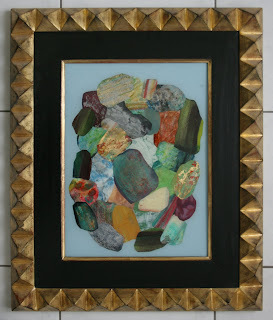 Meyers uses the example of the Russian painter Wassili Kandinsky, known as the “father of abstract art,” who late one night, on returning to his dark studio, found that he could not make out the subject on his easel, but was deeply moved by the shapes and colours. It was only later that he discovered that the painting was resting on its side. 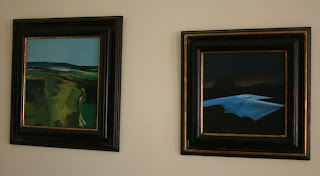 Nevertheless, this experience led him down the path of emphasizing the importance of the placement of forms and colours and deciding that “depicting objects was not necessary in my paintings and could indeed even harm them” . Meyers then suggests that too-close attention to detail may obscure the view of the whole. Randomness is a conception of non-order and directly associated with the concepts of chance and probability and so suggests a lack of predictability. There is no comprehensible pattern or grouping. Serendipity, as experienced by Kandinsky, is understood as an event that is an accidental discovery of something, especially when somebody is looking for something else and then making use of these chance encounters in a productive way. In his paintings created in 1912 at the height of his involvement with the avant-garde Expressionist group, Der Blaue Reiter, Kandinsky in a frenzy of randomness and serendipity floods the surface of his canvas with opaque and translucent colours. Amorphous forms appear to explode, overlap, and evaporate beyond the boundaries of the picture plane, alluding to the constant flux of energy and entropy at play in the universe. The goal of Kandinsky's art of this period, in the painter's own words, was "to awaken as yet nameless feelings of a finer nature." It is with these grand canvases, pulsating with colour, that the artist attempted to create a new aesthetic experience of 'otherness' for the 20th century. His highly personal colour theory was published in 1911 and meant to explain the painter's palette in two ways: the effect on the eye (person's physical understanding of the colour) and an unseen "inner resonance", psychological effect, when it effects your spiritual experience. He believed that the only way of depicting the unseen inner harmony of organic forms is through abstraction, which enevitably introduces an element of randomness in choice of form and colour and positioning in the picture plane. He wrote in 1914 (Concerning the Spiritual in Art) that: "The inner need is the basic alike of small and great problems in painting. We are seeking today for the road which is to lead us away from the outer to the inner basis. The spirit, like the body, can be strengthened and developed by frequent exercise. Just as the body, if neglected, grows weaker and finally impotent, so the spirit perishes if untended. And for this reason it is necessary for the artist to know the starting point for the exercise of his spirit. The starting point is the study of colour and its effect on men. There is no need to engage in the finer shades of complicated colour, but rather at first to consider only the direct use of simple colours". In 1922 Kandinsky accepted a teaching position at the Bauhaus, the state-sponsored Weimar school of ‘art and applied design’founded in 1919 by architect Walter Gropius. The school's curriculum was based on the principle that the crafts were equal to the traditional arts and was organized according to a medieval-style guild system of training under the tutelage of masters. Kandinsky conducted the Wall Painting Workshop and Preliminary Course and taught at all three of the school's sequential locations in Weimar, Dessau, and Berlin until 1933, when the Bauhaus was closed due to pressure from the National Socialist government. During this period geometric shapes came to play a dominant role in Kandinsky's pictorial vocabulary. He was interested in uncovering a universal aesthetic language and increased his use of overlapping, flat planes and clearly delineated forms. Geometrical elements took on increasing importance in both his teaching and painting-particularly the circle, half-circle, the angle, straight lines and curves (Fig 5). This change was due, in part, to his familiarity with the Suprematist work of Kazimir Malevich and the art of the Constructivists. Kandinsky's turn toward geometric forms was also likely a testament to the influence of industry and developments in technology. In his writings of this time Kandinsky analyzed the geometrical elements which make up every painting- the point and the line. He called the physical support and the material surface on which the artist draws or paints the basic plane, or BP. However, he did not analyse them objectively, but from the point of view of their inner effect on the observer. In placing his lines and shapes Kandinsky, although adhering to a standard vocabulary of shapes, was really making a series of arbitrary decisions with regard to the choice and placement of shapes and colours. With the same vocabulary, a different maker would make different choices. This is evident from Fig 6 where a computer was programmed to make a picture in Kandinsky's style. This raises the general issue of the viewer's interaction with a work of art where he or she has access to only one of many possible compositions. Kandinsky never made these comparisons but the creation of computer programmes, such as 'The Pattern Cognition and Aesthetics' programme now allows a scientific comparison to be made of the responses of different viewers to variations on an artistic theme . The PCA programme uses computer morphing technology to study 3D shape aesthetics. Experiments with this software are based on 3D laser scans of sculptures by the 20th century modernist Jean Arp from a variety of sources. The laser scans serve as the basis for arrays of Arp's morphed shapes in which geometric characteristics like surface curvature, axis curvature, and volume distribution are gradually varied (Fig 7). Subjects are asked to choose their favourite and least favourite sculptures in each array. The results are analysed to determine how these geometric characteristics influence aesthetic preference. Findings in this experiment are being used to design targeted tests of aesthetic responses in the human brain using functional magnetic resonance imaging. Jacek Tylicki began his work with nature in 1973. Taking pieces of paper or canvas, he sent them blowing into the wind, under trees and rocks, and waited for a time until recovering them to see what the world had done to them. He ended up creating a startling amount of beautiful forms, colours, and patterns that, in all actuality, he hadn’t made (Fig 8). Tylicki began to make nature do something that all artists do as well-create forms. The results are an array of shapes and designs that are unique; full of movement and detail that a person could not ever hope to make on their own. He harnesses nature’s hand to make something more permanent than itself. "Avoiding all control, I spread out sheets of white paper or canvas in the nature. For some time they stay in the grass, in the rushes of river, in the meadows or in the mountains. Nature registers its presence, covering the surface of the paper with colors, forms and tracks. This process is controlled by a number of agents; such as space and time, substance and causality. It is governed by nature’s intensity. It does not, depend on man’s interference. Nature is the greatest and most admirable creator, and unlike logic it doesn’t fail.The artist obligation is not to shape -handicraft, but to understanding the riddles of reality. In such conception of Art there lies, as in the Universe itself, an immense richness, and a countless variety of forms." Nature registrations were produced in 2008 by Jill Randall an Artist-In-Residence at the Parys Mountain Copper Mine and Amlwch Industrial Heritage Centre in North Wales. The Parys Mountain was once the world’s leading centre of copper production. It is an extreme environment, with its own “terrible beauty” of amazing colours, a toxic landscape where corrosion and time are accelerated. Beneath the skin of the landscape lie hidden voids, the vast underground network of abandoned mine shafts where peculiar life forms grow in the complete absence of light. 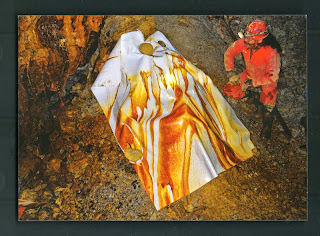 The outcome of her residency was a series of 10 huge, brightly-coloured registrations created in and by the abandoned underground mine workings (Fig 9). Physically and practically very difficult to site and retrieve the colours were the results of on-going chemical reactions in the water percolating through the rock strata into the man-made caverns of the mine. The stained registrations on the Randall’s art substrate reflect the mineralised colours in the walls of the mine. 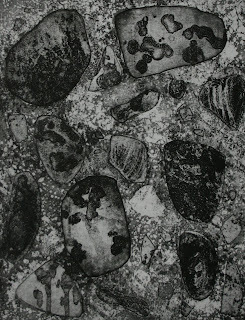 Both kinds of chemical interactions are also open to interactions with the concrete surfaces of the art works of Michael Deane which demonstrate that hardness can be deceiving.Despite its reputation for intransigence, concrete is a uniquely subtle, delicate material. The surface of any motorway flyover, housing block or city pavement reveals a spectrum of patinas through which concrete absorbs and reflects its surroundings. Metal fixings soak rusty stains into their concrete bases; shoes and rubber tyres apply patient layers of dirt and oil onto walkways and roads, and rainwater causes streaks of colouration to develop across walls. Michael Dean exploits this aspect of his material’s versatility in surprising ways. He makes objects that betray intricate records of their histories on their outer surfaces. Even the mineral content of tap water can dramatically affect the way concrete looks. It remains porous when hard, so oils from contact with human skin give it an organic quality. Some of Dean’s works have the uncanny appearance of elephant hide, dark whale skin or cured panels of leather; others resemble nothing so much as giant fossils, plant matter preserved and fractured beneath layers of peat bog. All of these associations are, to different degrees, ancient, and make us forget that the sculptures they cling to only recently came into the world through his efforts. Meirle Ukeles' work is created through a process of participatory democracy that unites people in open dialogue about the characteristics of important community ecological issues. In 1976 Ukeles accepted an unsalaried position as artist-in-residence with the New York City Department of Sanitation. She proposed to do work that would incorporate a dialogue of community participation around life-centred issues, and ecological sustainability. Ukeles focused her creative energies on a series of long term projects to provide visitors with points of access to issues of urban waste management which is the 'material entropy' of consumerism. Touch Sanitation was Ukeles' first project as the city's new artist-in-residence. She drew attention to the maintenance of urban ecological systems in general and the unjustified use of pejorative language to represent "garbage men" in particular. Ukeles travelled sections of New York City to shake the hands of over 8500 sanitation employees or "sanmen" during a year-long performance (Fig 11). She documented her activities on a map, meticulously recording her conversations with the workers. Ukeles documented the workers' private stories, fears, castigations, and public humiliations in an attempt to change some of the negative vernacular words used in the public sphere of society. In this way, Ukeles used her art as an agent of change to challenge conventional language stereotypes. Like throwing a paint soaked sponge against a wall, making a work of art is a process consisting of a series of actions taken in order to achieve a particular end when energy becomes form. The actions consume energy and it seems reasonable to assume that the entropy of making a complex work of art is more that that required to make a simple one. The finished work prompts a response from the viewer according to his or her understanding of the ensemble as a system of interrelated parts. The ensemble has properties more than the sum of its parts and the work holds the attention of the viewer or a listeners according to their understanding of its dynamic complexity. In this respect, there are three kinds of complexity, that based on the structure created by its maker, that perceived by the viewer or listener and that accepted as a cultural norm by society. An audience experiences the complexity of a painting through the patterns of paint marks mapped out across the spatial dimensions of a canvas. These patterns are static in the sense that they do not evolve with time. However, the audiences will experience a musical work’s complexity through the development of the pattern of sound as a function of time. Any work of art thus finds it’s own audience by inviting them to make what they will of this or that idea as part of the relationship between objective, subjective and social complexity. Complexity can literally be defined as being “made up of a large number of parts that have many interactions.” This definition has been applied to many subjects, such as art, music, dance, and literature. In aesthetics research, complexity has been divided into three dimensions that account for the interaction between the amount of elements, differences in elements, and patterns in their arrangement. Furthermore, this characteristic in aesthetics consists of a wide spectrum, ranging from low complexity to high complexity. Key studies have found through the Galvanic skin response that more complex artworks produce greater physiological arousal and higher hedonic ratings, which is consistent with other findings that claim that aesthetic liking increases with complexity. Most important, several studies have found that there exists a U-shape relationship between aesthetic preference and complexity. In other words, the lowest ratings in aesthetic responses correlate with high and low levels of complexity, which displays an “avoidance of extremes.”Furthermore, the highest level of aesthetic response occurs in the middle level of complexity. In a study of undergraduates’ ratings of liking and complexity of contemporary pop music reported an inverted U-shape relationship between liking and complexity. Other research, suggests that this trend of complexity could also be associated with ability to understand, in which obserevers prefer artwork that is not too easy or too difficult to comprehend.The research both confirms and disconfirms predictions that suggest that individual characteristics such as artistic expertise and training can produce a shift in the inverted U-shape distribution. This relationship between objective, subjective and cultural complexity across the arts has been explored by Jean Pierre Boon, John Casti and Richard Taylor who focused on the spatial complexity of Jackson Pollock’s abstract paintings (Fig 12) and the temporal complexity of Johann Sebastian Bach’s music as well as about 30 music pieces by various composers. They measured the objective complexity using established tools of complexity theory fractal dimension ( D) to quantify the global dynamics and entropy (H) to measure the local dynamics. They found that over a period of ten years (1943-1952) Pollock refined his fractal construction process and appeared to be able to tune the D value and hence the objective complexity of his paintings. As a consequence, his masterworks gravitated to an objective complexity of 1.7. The researchers also found that the musical compositions of Bach have a similar level of objective complexity. They suggest that the D values of Pollock's work appear to be trademark signatures of his unique objective complexity, and might potentially help in distinguishing authentic Pollocks from imitations although this does not seem to be the case for musical compositions. "How can we find our way through what separates words from what is both without a name and more than a name: a painting? What is it that we are trying to go through? The space of the very act of naming? At any rate, it is not the space of "first naming," or of the incipient naming of the infans; nor is it the one that arranges into signs what the subject perceives as separate reality. In the present instance, the painting is already there. A particular "sign" has already come into being. It has organized "something" into a painting with no hopelessly separate referent; or rather, the painting is its own reality. There is also an "I" speaking, and any number of "I's" speaking differently before the "same" painting. The question, then, is to insert the signs of language into this already-produced reality-sign-the painting; we must open out, release, and set side by side what is compact, condensed, and meshed. We must then find our way through what separates the place where "I" speak, reason, and understand from the one where something functions in addition to my speech: something that is more-than-speech, a meaning to which space and color have been added. We must develop, then, a second-stage naming in order to name an excess of names, a more-than-name become space and colour-a painting. We must retrace the speaking thread, put back into words that from which words have withdrawn"
The above quotation is one person's translation of the first paragraph of an essay by Julia Kristeva, entitled 'Giotto's Joy'. It sets the scene for a discussion on fundamental aspects of representation, perception and interpretation in the system involved in creating a picture and getting a textual response from its viewers. The ideological framework of this discussion is set out in Fig 1. Kristeva illustrates this system by analysing Giotto's use of an innovative Christian iconography in the frescoes that line the ceiling and walls of the Arena Chapel in Padua. He completed this project circa 1305. More of his frescos in this idiom can be found in Assisi and Florence where he depicted the life of St Francis. In particular, Kristeva attempts to explain the concept of jouissance, which is a term equated with the joy of innovation that overcomes an artist who has transgressed a previously accepted pictorial cannon. Giotto's deviations at Assisi departed from previous practice at Padua in that St. Francis, the Virgin Mary, and Christ, resemble the clothed peasants of Giotto's time. This moved away from the powerful convention that saints should be presented in richly coloured, embellished clothing, which emulated the growing wealth of princes and merchants of the time, who were more often than not the patrons of Giotto and his contemporaries. This very significant painterly innovation goes hand in hand with Giotto's disruption of previous norms of space and colour. Regarding space, Giotto is thought of as a founder of modern western painting because his work broke free from the stylizations of Byzantine art, which were dedicated to producing elaborate two-dimensional decorative images of Christ and the saints to be worshipped as holy icons in church. In this respect, Giotto may be regarded as the inventor of graphic art by introducing a convincing sense of drama involving clusters of interacting figures in a three dimensional space. Before Giotto's time, medieval graphic art appeared mainly in manuscript illumination, where for centuries, flat two-dimensional illustrations had been inserted in the margins of Bibles, stories of saints and other texts. 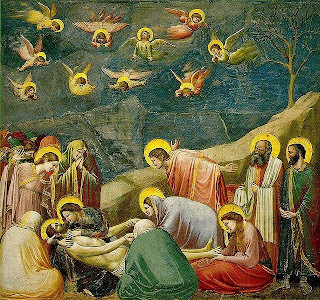 Giotto's art liberated the images of biblical stories from the Bible. The stories now could be 'seen on stage' by everyone. This text-less format of story presentation was a critical step toward the later rediscovery of popular drama. Giotto's pictorial drama not only freed the images from text; it made the pictures speak and move with fluid human motion. It is not surprising in this context, that St Francis was a natural subject for Giotto to paint, because Francis also liberated text from the Bible. Francis lived simply according to the teachings of Jesus in the New Testament. In his own life he presented Jesus as a model of behaviour for all people. 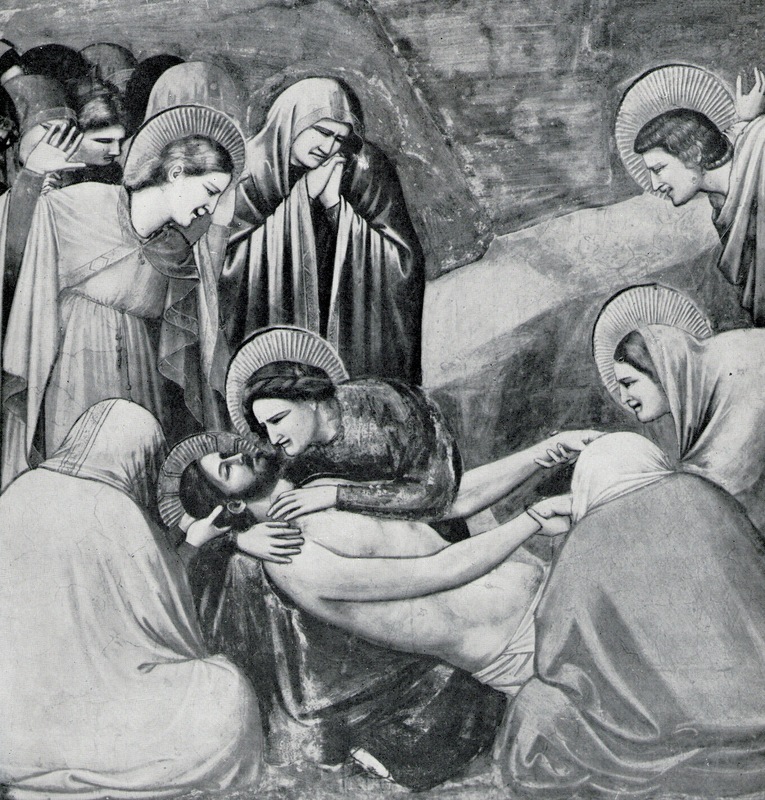 Giotto's mastery of the depiction of drama at Padua is seen in the group of figures surrounding Christ at his entombment (Fig 2). The innovation is obvious when compared with the stylised composition of earlier artists (Fig 3). The first use of "histories of subjects" or "biographies", as well as the introduction of the principle of narrative into Christian art are ascribed to Saint Bonaventura. The latter's 'The Mind's Road to God' (1259) is a masterpiece of common place communication showing the way by which man as a creature ought to love and contemplate God through Christ after the example of St. Francis. In this respect it justified the admission of popular oral tradition into the Christian pictorial art of the time by disrupting the twelve-centuries-old, rigid Christian canon originating in Byzantium at the beginning of Christian evangelism. There are pictorial biblical narrative episodes in the nave of Santa Maria Maggiore in Rome (fourth century), but it would seem that the oldest story sequence pertaining to the old Testament is in the Church of Sant' Apollinare Nuovo in Ravenna. This was the Imperial stronghold of Byzantine culture on Italian soil. In illustrated manuscripts of the sixth century, illuminations follow a logic of narrative episodes. These Byzantine mosaics, including those at St. Mark's Church in Venice, depict detailed scenes and sequences of dramatic and emotional scenes, but without any comprehensive story line to seal the entire fate of a particular character. In contrast, the narrative of the Giotto frescoes at Padua, which are simply and logically limited to the basic episodes of the lives of Jesus and his mother, suggests that the democratization of the Christian religion was effected by means of painterly biography. On the walls of Padua we find a masterful expression of personal itineraries. Within Giotto's pictorial sequence, the notion of individual history is, in fact, more developed in the Padua frescoes than in those at Assisi. The final point regarding Giotto's graphic innovations is that in these works, particularly at Padua, colour disrupts and breaks with the chromatic codes operating in Christian iconography in the thirteenth century. 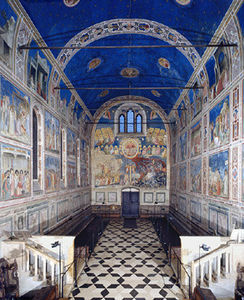 In particular, the decentring influence of Giotto's bold use of the colour blue dominates one's first impression of Giotto's painting in its setting of the Arena Chapel (Figs 4 & 5). Kristova says we are overwhelmed by a coloured substance, rather than by the form or architecture. One is struck by the light that is generated, a light that catches the eye because of the dominance of the colour blue. Blue takes hold of the viewer at the extreme limit of the human range of visual perception, lessening both object identification and the ability to fixate on form. In Italian Renaissance art, the term "colorito" means "colouring", and since Giotto's time the word has come to be used to describe the priority accorded by 13th century Venitian artists to the mastery of colour pigments and tones in painting. The main alternative to colorito was "disegno", which favoured the art of drawing over colourism, because the former was deemed to be inseparable from the intellectual conception of the painting itself, and thus superior to the mere mastery of coloured paint. This debate, which raged throughout the Early Renaissance (c.1400-90) and the High Renaissance (c.1490-1530) was a very serious dispute over aesthetics, and was argued over by many of the leading exponents of academic art, until the 19th century. The question as to which was more important in art, drawing (disegno) or colour (colorito), was answered differently according to whether you lived in Florence or Venice. The fact was, painters from different areas of Italy approached the depiction of nature quite differently and, as a result, created works of art that differ not only in technique and appearance but in their very conception. During the Renaissance in Florence, a city sandwiched between Siena and the Papal States, artists looked for inspiration to the re-discovered humanism and order of Classical Antiquity. For these Florentine painters "drawing" or "design," was seen as the key Greco-Roman starting point of artistic endeavour, the primary means for portraying nature as realistically as possible. However, artists of the Renaissance in Venice had a completely different view. Their powerful northern Italian Republic, with its worldwide maritime trading links and overland trade routes, had close associations with Byzantine mosaic art, famous for its shimmering gold icons and its inattention to figurative realism. Not surprisingly therefore, Venetian art favoured a more colouristic approach, bolstered no doubt by its lucrative trade in pigments, such as Ultramarine (Lapis Lazuli), Chinese Red, Indian "Lac", Verdigris and Indigo. This Venetian colourism was further stimulated by the city's damp climate, which was less suited to fresco and tempera paints, and more suited to oil painting - a medium which thrived on sophisticated colour and tone. For optimum naturalism, Venetian painters placed a particularly high value on the correct application of colour, without which they believed no artist could properly capture the real effects of light and thus the true appearance of the object. The Venetian School of painting therefore paid great attention to the process of layering and blending colours to achieve a glowing richness. 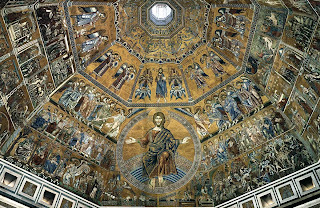 As to the origins of the pre-Giotto use of blue e have to look to the art of mosaic. 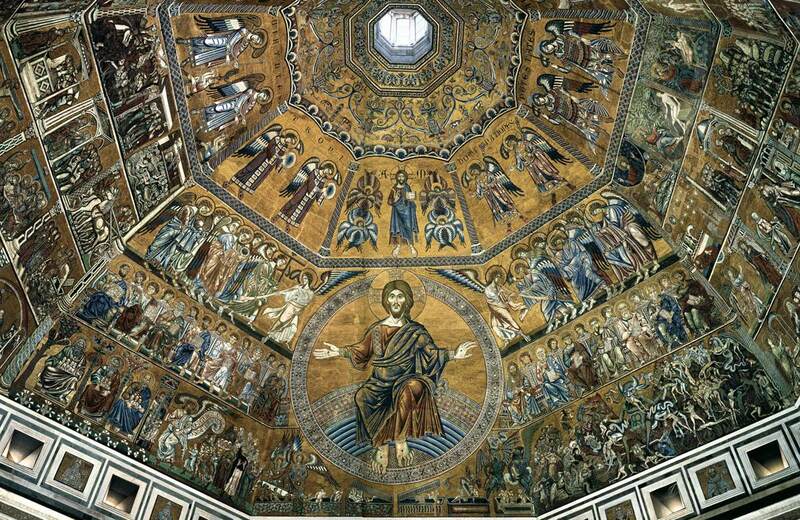 Before Giotto, the application of blue on the scale of Padua was limited to Byzantine mosaics. Whereas Roman mosaics were mostly used as floors, the Byzantines specialised in covering walls and ceilings. 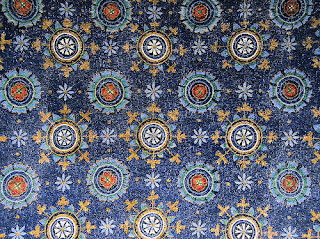 This can be seen with great effect in the small chapel, the so-called mausoleum of Galla Placidia in Ravenna. This small brick structure dates from around 430 AD, making it one of the oldest monuments in Ravenna. Galla Placidia, a powerful Roman empress, was never buried here but she likely commissioned the building. The interior of the mausoleum is covered with rich Byzantine mosaics, and light enters through alabaster window panels. The inside contains two famous mosaic lunettes, and the rest of the interior is filled with mosaics of Christian and Apocalyptic symbols. The most dominant mass of blue covers the ceiling, which represents a starry sky (Fig 6). The Mausoleum is built to a Latin cross plan, and the main symbol of the mosaic in the dead centre of the vaulted ceiling is a celestial cross that shines among the stars in the heavens. This is the world of eternal salvation, the heaven of the Kingdom of God described by St. John in the Book of Revelation. As soon as congregants entered the ancient churches of Ravenna, they stood in a three-tiered sacred cosmos. A starry night sky or a view of multi-hued clouds represented the first tier, the heavens, where celestial beings hovered; from this mysterious realm, the right hand of God emerged to bless the world. The second tier was an intermediary space over which the living Christ presided. The departed saints stood with him in the meadows of Paradise who visited to bless the living. The third tier was the floor of the church where worshippers stood in God's garden on earth. 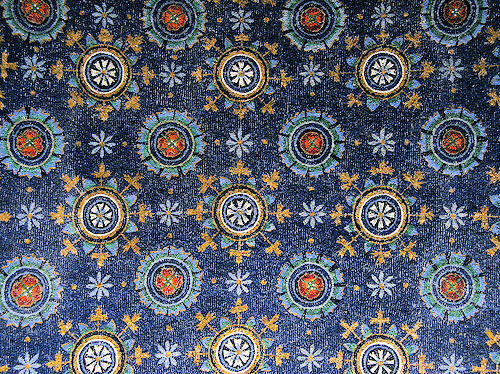 This is the sacred cosmos represented in the mausoleum of Galla Placidia with the use of blue for meditating on the drama of the celestial realm. In looking at the celestial realm we see more than distant points of light. In gazing at the most distant reaches of space we encounter the most intimate parts of our human nature. The interior central dome displays a midnight blue sky that teems with gold stars. A simple Latin cross marks the centre apex of the sky, and the winged creatures of Ezekiel's apocalyptic heavenly vision -a lion, ox, eagle, and man- emerge from red and white clouds in the corners of the dome. Below the celestial heavens, arches frame half-moon lunettes that depict paradise: spiralling grape and acanthus vines grow abundantly, bushes are laden with fruit; deer and doves drink at fountains and pools; and saints stand in green meadows. 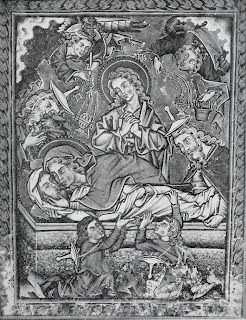 In one lunette, Christ appears as a good shepherd, the last existing early image of him as a shepherd. He sits on a pile of stones in a shrub-covered, rugged landscape. His beardless, boyish face, framed by wavy shoulder-length hair, turns across his right shoulder toward a sheep that gazes at him from the rocky outcrops. With his left hand, he holds a shepherd's staff in the form of a cross-shaped labarum, and his right hand extends to touch the uplifted face of a sheep. Ancient visitors to this shrine would have stood, one level below on the stone floor looking up at the canopy of the heavens, and around at the paradise that was home to Christ and the departed saints. This was the destination of redeemed men and women.In this three-tiered universe, paradise had both a "here" and "not here" quality. Christians taught that paradise had always been here on earth. Sin had once closed its doors, but Jesus Christ had reopened them for the living. While Christians could taste, see, and feel the traces of it in ordinary life, they arrived most fully in paradise in community worship. With its terrestial art and buildings, the church conceptualisd a physical a space that united the living on earth with the heavenly beings and departed saints who surrounded and blessed the living. The risen Christ and a multitude of community witnesses embraced this life and lifted it to touch the heavens at every Eucharist. In that holy ritual, the community stood within the sacred cosmos, blessed by the fruits of the earth and the power of the saints. What congregants did not see in these mosaics however, was a depiction of Jesus's death. Images of the Crucifixion did not appear in churches until the tenth century. In the sixth-century church of Sant'Apollinare Nuovo in Ravenna, twenty-six rectangular mosaics near the ceiling of the nave tell the life story of Jesus. On the right wall near the chancel, an image of the Last Supper begins the thirteen scenes of his Passion. At panel ten we encountered Simon of Cyrene carrying the cross for Jesus to Golgotha. We expected to see the Crucifixion on panel eleven. Instead, we were confronted by an angel who sat before a tomb. The apparition spoke to two women swaying forward like Gospel choir singers. The words of the angel are: "I know that you are looking for Jesus who was crucified. He is not here" (Matt. 28:5-6). There are no depictions of the Crucifixion in any of Ravenna's early churches. 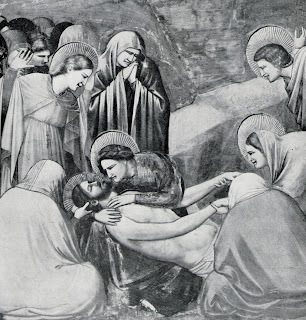 The death of Jesus, it seemed, was not a key to meaning, not an image of devotion, not a ritual symbol of faith for those pioneer Christians who worshipped among the churches' glittering mosaics. The Christ they saw was the incarnate, risen Christ, the child of baptism, the healer of the sick, the teacher of his friends, and the one who defeated death and transfigured the world with the Spirit of life. This Franciscan transfigured world is paradise reopened as the destiny of eternal life. The legacy of working in mosaic with a dominance of cobalt blue in the firing of very small tesarae continued into 13th century art in Venice and Florence. As a citizen of Florence, this is where Giotto would have been reminded of the continuity of early Christian art and its icons (Fig 7). 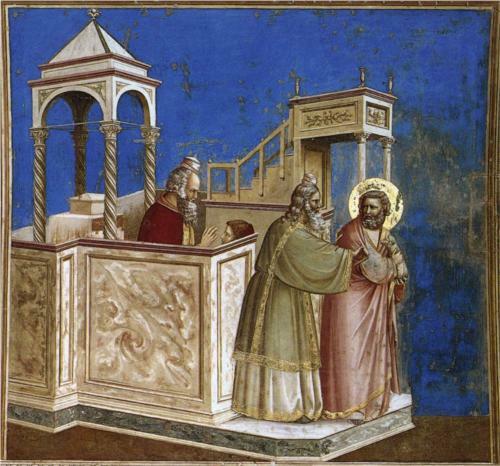 Thus, Kristova says it is in conjunction with Giotto's innovations in the use of blue pigments that Western painting began to escape the constraints of narrative and perspective norm. Centuries later it was again through innovations in the application of colour that narrative and representation itself was changed (as with Cezanne, Matisse, Kandinsky, Mondrian Rothko) and new creative joys were released in each and every innovator. Matisse spells it in full: it is through colour-painting's fundamental "device," in the broad sense of "human language"-that revolutions in the plastic arts come about. "When the means of expression have become so refined, so attenuated that their power of expression wears thin, it is necessary to return to the essential principles which made human language. They are, after all, the principles which "go back to the source," which relive, which give us life. Pictures which have become refinements, subtle gradations, dissolutions without energy, call for beautiful blues, reds, yellows, -matters to stir the sensual depths in men". So much for the insight of Matisse. For Kandinsky, blue is the colour of spirituality. After all it was invariably the colour of the inner garment of the Maddona. The darker the blue he said, the more it awakens human desire for the eternal. "The deeper the blue becomes, the more strongly it calls man towards the infinite, awakening in him a desire for the pure and, finally, for the supernatural... The brighter it becomes, the more it loses its sound, until it turns into silent stillness and becomes white." Indeed, modern research shows that blue light interacts with the brain centres responsible for processing emotion. In these experiments volunteers were exposed to green or blue light while a neutral or angry voice recited meaningless words. As expected, the brain responded more strongly to the angry voice, but this effect was amplified by blue light. Semiotics is a branch of linguistics which puts us in touch with the truism that words are separate from the things that they represent. 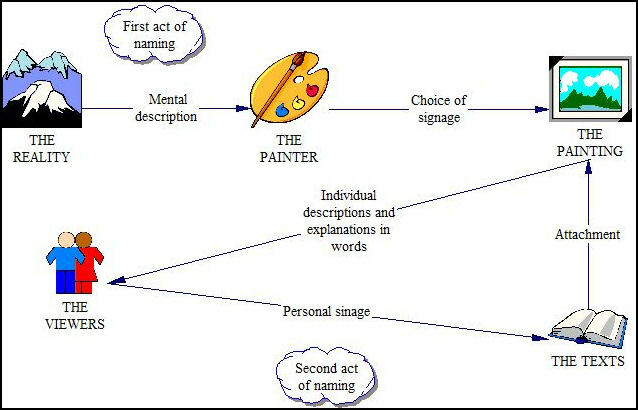 The semiotic relationship between words and things is amplified when trying to describe abstract concepts like the artistic use of sound, colour, or language itself. This is the area in which Kristeva places the artistic process of arranging "into signs what the subject perceives as separate reality'. In fact it is with full understanding of the futility and ridiculousness of this endeavour that we toss ourselves haphazardly down the path of attempting to nail words onto art by retracing "the speaking thread, and put back into words that from which words have withdrawn". 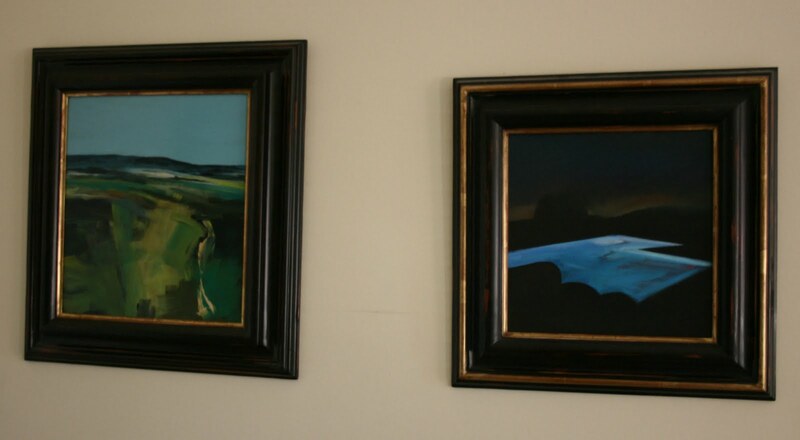 Exploring the space between painter and academic, all that an individual can do is trace a scholar's interpretation of the origins of a picture from the first mental vision of the artist ending up with the two dimensional expression of his invention in form and colour. The human species is known as Homo sapiens sapiens, which basically means "a being that knows their knowing". What distinguishes us creatively from other forms of life is our capacity for metacognition-the ability to stand off and examine our own thoughts while we engage in them. Occurring in the neocortex, metacognition, or thinking about thinking, is our ability to know what we know and what we don't know. It is our ability to plan a strategy for producing the information that is needed for knowing, to be conscious of our own steps and strategies during the act of problem solving, and to reflect on and evaluate the productiveness of our own thinking. The major components of metacognition come into play when we are confronted with a problem to solve, developing a plan of action, maintaining that plan in mind over a period of time, and then reflecting on and evaluating the plan upon its completion. Planning a strategy before embarking on a course of action, whether the intended outcome is a work of art or a motorway, helps us keep track of the steps in the sequence of planned behaviour at the conscious awareness level for the duration of the activity. It facilitates making temporal and comparative judgments; assessing the readiness for more or different activities; and monitoring our interpretations, perceptions, decisions, and behaviours in relation to the intended outcome. This is the route of thinking and monitoring progress that Giotto insists we take when viewing his pictures. Historians of art, like all thinkers, reflect on and evaluate the quality of their own thinking skills and strategies. Metacognition means becoming increasingly aware of one's actions and the effect of those actions on others and on the environment; forming internal questions in the search for information and meaning; developing mental maps or plans of action; mentally rehearsing before a performance; monitoring plans as they are employed (being conscious of the need for midcourse correction if the plan is not meeting expectations); reflecting on the completed plan for self-evaluation; and editing mental pictures for improved performance. In her essay, Julia Kristeva reflected on Giotto's process of picture making in the spirit of metacognition. 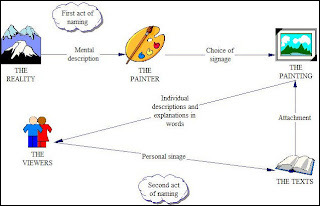 The mental map in Fig 1 is the application of metacognition to the production of a knowledge framework for taking this further. In Fig 8 this map can now be particularised to trace the speaking thread from the first mental meaning that activated Giotto to apply paint to a wall in the hope of releasing a burst of jouissance, a process which leads to the words of the art critics verbal comment on the artists creativity. The big question for those researching the languages of representing reality is why do some suggest that the motivations behind art and science represent conflicting impulses, while others see the two approaches as integrally related? Model-making is an essential feature of all human thinking and applies to obtaining both a scientific and an artistic understanding of the world. In both activities, the "abstraction ladder," leads from observations of a material reality to simpler models made visible using the 'languages' of numbers, diagrams, poetic descriptions and pictures. Through abstraction, art as picture making today is becoming increasingly complex and referential; aspects of culture and our ecological identity are constantly being brought to together, by either implication or association, in landscape. The conjunction of these processes in the work of Susi Bellamy, implies a new way of cross-discipline thinking, which needs clarification through the critiques of artists and/or scientists if none is provided by the artist herself. As soon as a person starts to think she starts to criticize. Human nature is inclined to comparison and discussion, particularly now that we live in an age when the public have come to expect the artist to constantly review her relationship with images. This is usually achieved using abstract forms. The objective is to create a personal language for articulating a sharper reality of relationships between people, environment and the psyche. Explanation of a work of art involves discovering a meaning and its significance to the human condition. An important part of the critics' role is to discover and write about the intended and perceived meanings the work may have for the viewer. This is particularly important when reviewing Susi Bellamy's work because she has been for the past two decades always in the territory of experimentation. There she has engaged with research into pictorial representation aimed at the blurring of direct human references in order to reconstruct a more thoughtful relationship between people's inner and outer worlds. From time to time she has immersed herself in the skills of representational art to create traditional still life and portraits. 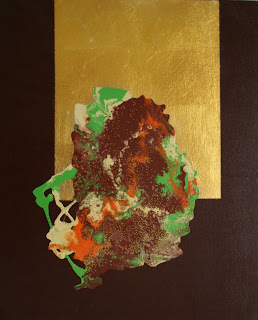 But her real motivation has been to apply old master techniques and palettes to create abstract metaphors of topographical mindfulness. In this endeavour she grapples with the historical procession of art in order to re-conceive, experience and revise it as a personal language. 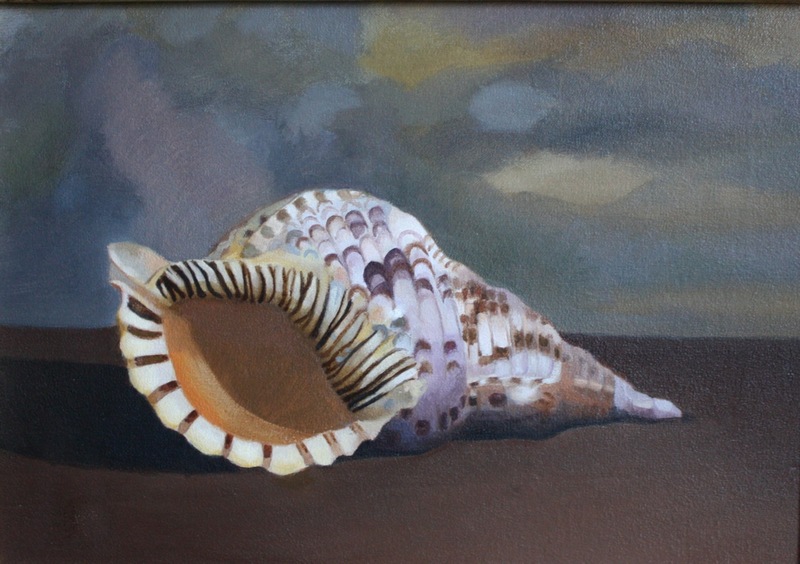 Since the 17th century exotic shells were a favourite item in still life paintings, often in combination with large bouquets of flowers. 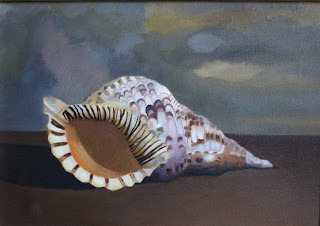 Many would say that Susi Bellamy has picked up this historical thread of realism to explore the way randomness and precision, which come together in shell pigmentation, may give rise to pleasing patterns. Every artist has to find a way of describing the inner truth of things. This is the unified complex of characteristics that give each thing its subjective uniqueness and differentiates it from other things. Then there comes the definition of a route to transmit it as a mental wholeness to others in the hope that it will be seen as more than a pleasing image. The term 'inscape' was invented by the Jesuit poet, Gerard Manley Hopkins, to describe inner truths of things in conjunction with the term "instress." By "inscape" he means the unified complex of characteristics that give each thing its uniqueness and that differentiate it from other things, and by "instress" he means either the force of being which holds the inscape together or the impulse from the inscape which carries it whole into the mind of the beholder. He also uses the term to mean ‘the stress within’, the force which binds something or a person into a unit. Modern neuropsychology is investigating these two aspects of seeing and communicating because it is at the heart of both our feelings of 'belonging' and 'alienation'. In the poem "Ad Marian," Hopkins impersonates the inscape of the month of May in a pre-Christan spirtitual setting as Spring's daughter. In so doing, we see the inscape as an archetype of the Mother of all humankind, who is as vital "as Dew unto grass and tree." The poems remind us that the female principle of fecundity is ever present in the landscape. It is significant therefore that Susi Bellamy during a period of residence in Italy came to focus on the re-construction of 13th and 14th century icons of the Madonna. Her starting point was the extensive collection of Madonnas in the Venice Accademia Galleries, where they are stranded high and dry from the sea of faith which produced them seven centuries ago. 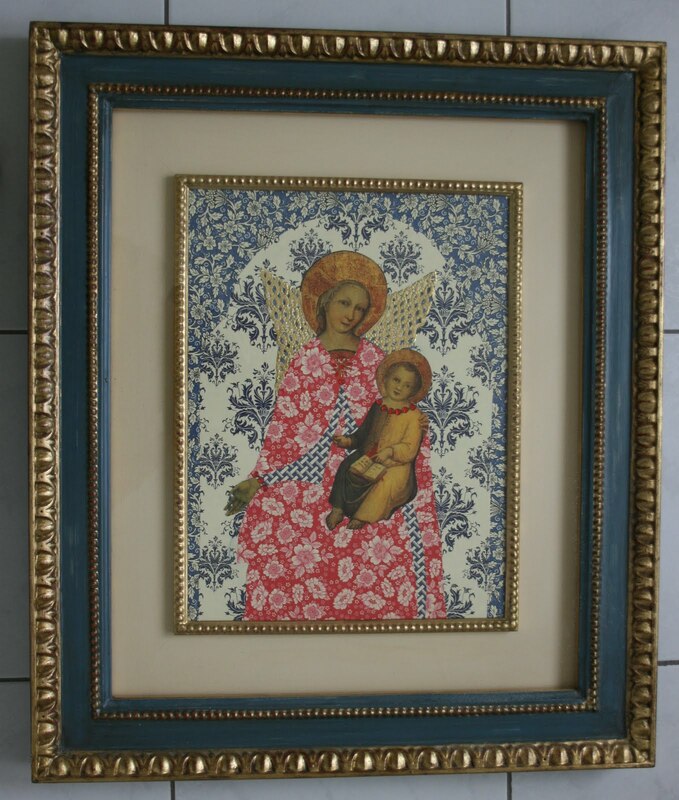 What she has produced are powerful and disturbing contemporary icons of motherhood in which the naturalistic facial features of Mary and her child are enfolded in a complex expanded decorative collaged cosmos. Their instress emphasises the truth that a noisy unruly world can't take away the persona and its relationships with the processes of nature. They are most essential for each of us. These Madonna inscapes should be reassuring to anyone in the midst of a world of trivial productions that is threatening to remove what is most essential to their individuality. Susi's choice to manipulate a powerful Christian icon is not the beginnings of cultural disavowal but an attempt to make visible and readable what for most people in the West has become withheld from comprehension and symbolisation. 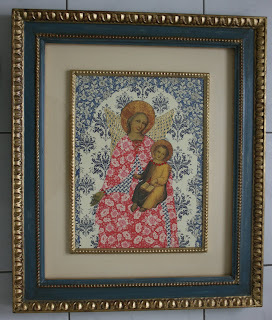 She has made the surfaces of the paintings visibly deeper and each Madonna is the equivalent of a mental 'big bang'. The decorative random, yet ordered, matrix constructed from mass-produced paper patterns produces a deep cosmic depth in which many narratives are possible in the mind of the viewer. Her pictures, like the works that led up to them, are really toolkits for meditation on our affair with consumerism, which today pervades everything we are. Every day, we move through landscapes that are the historical results of local economic processes of programmed randomness. Susi began painting on the premise that there are many ways to combine abstract language with the stylistic forms of figurative painting to reveal intermediate hidden truths of mental picturing. This is evident in her many 'halfway away/half way back' effects, which are the outcomes of moving up and down the ladder of abstraction on a quest to capture and transmit more than is visible to the naked eye. This has involved the controlled use of randomness to enable works to form freely. 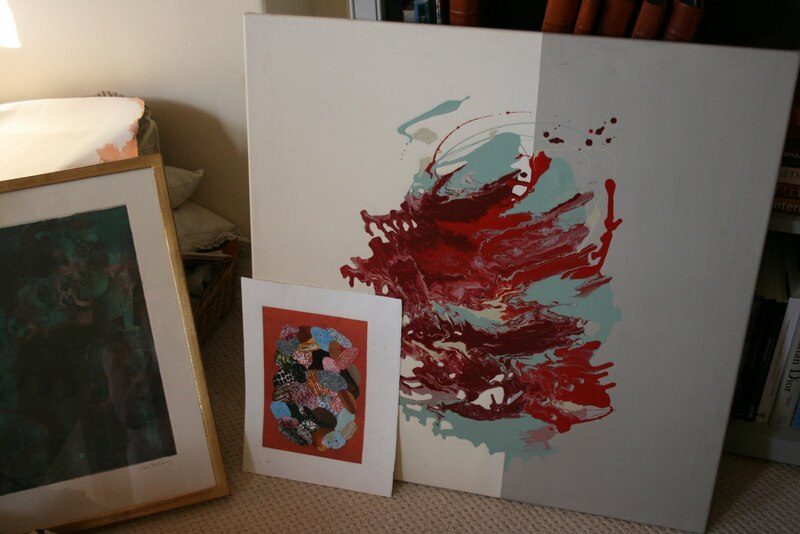 The Madonna pictures came after a period when she was engaged in producing formless but dynamic 'plasmas' which explored combining chaos and order of liquid paint on tilted canvas. In the end, order prevailed in which areas of colour were arranged like rows of classified rocks and vibrant microcosms constrained within golden ribbons. 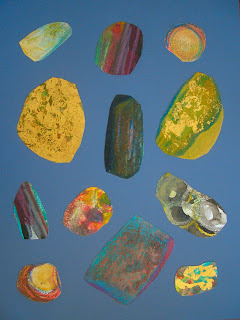 The Madonnas and their characteristic colour palette seem to emerge from the end point of this phase where entities coalesced like technicoloured polished sections cut through meteorites. This emphasises that Susi's consistent probing approach to reveal inscapes has been based on the adoption of a distinctive, vibrant palette echoing the false digitised colours used by astronomers to delineate the complexity of galaxies and the birth and death of stars. In this respect, they are miniature expressions of cosmic thinking. 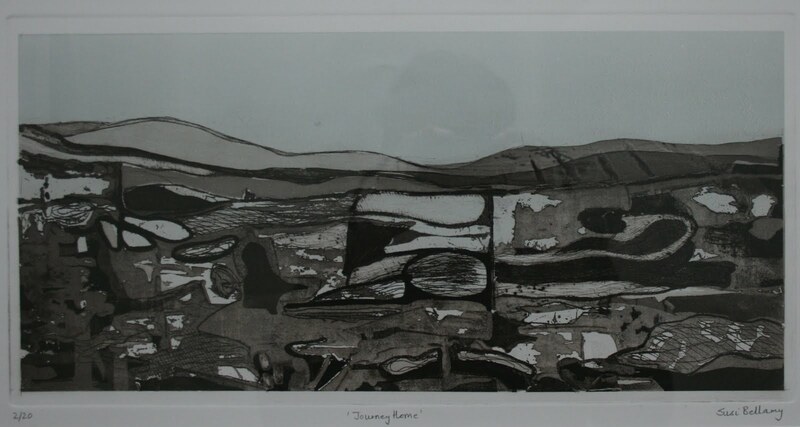 Another development of randomness-with-order, was her printmaking carried out in the Florentine print workshops, which served Picasso and Henry Moore. In these experiments rows of darker, angular, horizontal structures divide up a landscape format, like inscribed stone walls. These are inscapes where the instress could focus on compartmentation as symbolising either 'belonging' or 'exclusion'. Regarding the expressive power of her work, an ambiguity of meaning is one of its most definitive characteristics. At one time you may imagine you are looking at a section of Hadrian's Wall in the empty Northumbrian landscape. Another time, the same picture may appear as a piece of crumpled patterned fabric. A jagged mass of blue might be a transient break in a threatening sky implying a forthcoming natural disaster, whereas its incidental feature was the surface of a lighted swimming pool overlooking a deep Tuscan valley in twilight. Here, as in most of her work, Susi literally harnesses randomness and makes it operate on the entities selected for exploration. Many people like her paintings, probably because, as just another species, and the result of natural selection, we seem to gladly embrace fractal and chaotic structures and work on them to discern some kind of order. In the ever-threatening world in which our biological evolution occurred, such behaviour would confer a survival advantage by reinforcing a sense of place. With her early background in fashion journalism it was inevitable that Susi would become interested in the relationship between the frame and the picture. In contemplating a picture, the frame is generally taken for granted. It is a fait accompli, and most of us may be unaware of how powerfully the frame can influence our perception and enjoyment of the picture within. It was in Florence that she studied the classical proportions, abstracted sculptural ornament and muted patina of Renaissance and Baroque frames. Florentine frame-making is part and parcel of the family histories of master carpenters who still ply a trade as old as the Madonna icons. The marriage of picture and frame may be harmonious or discordant, enhancing or depressing, or somewhere in between. In Susi’s view, most private and public collections contain pictures the true impact of which has been compromised by their frames - often in an insidious way - for decades or even centuries. 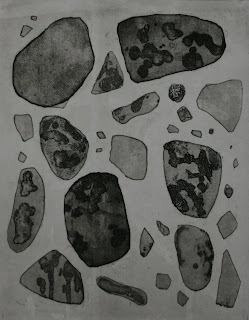 Susi is adamant that the artist should devote much thought to the way a frame can enhance the 'performance' of an image. Her frames possess a timeless quality, not necessarily related to a specific period of interior decoration. In all her works, Susi has produced modern icons for meditation on the birthing moments we all have when suddenly becoming aware of a new arrangement of the natural or built environment. This is a pointer to the fact that for many modern artists the instress of human adaptation to environment is a steady process of being at one with the physical laws of the universe and the random events they produce. Humanity is not the one-off supernatural project of an omniscient being. The opening up of windows on non-religious spirituality happened for Susi Bellamy when she gave up strict control over the application of paint with a brush to dribble and paste directly onto the canvas. The actual shapes, patterns and textures were largely determined by the random dynamics of the material and her process: the viscosity of the paint and the speed and direction of its flow on the canvas. 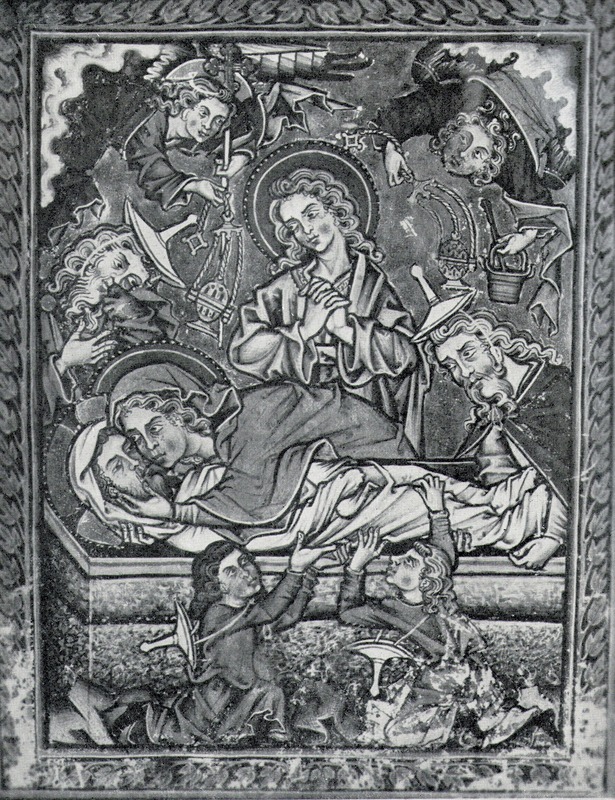 An important random factor in the making of Madonnas was the availability of commercial patterned papers. This is simply to say that throughout her career Susi has been firmly in the territory of artistic experimentation, intent on making various kinds of paintings as alternative solutions of equal worth rather than attesting to a life-long process of relentless technical development. Her consistent aim has been to render visible 'inner' or 'immaterial' phenomena. In this respect, she sits firmly at the forefront of part of the contemporary art scene, which is a play of language, reality and image. As art and science continue to bump up against each other, new images are constantly required to express new models of reality and Susi's diversity of artistic style becomes a deliberate stylistic principle of cross-disciplinary research.